“Do not worry about life or about your body. Mass anxiety seems to be the hallmark of modern society. We are worried and anxious about so many things, and if we are not anxious for a moment, we are soon told about something we should be anxious about. Soon we are suffering from cycles of fear and anxiety, which lead to stress, anger, resentments, and even depression. How can we break ourselves free from these recurrent and seemingly endless cycles? The First Noble Truth of the Buddha says the “Life is dukkha,” which is often translated as suffering. In my weekly prayer group, we have often talked about the concept of suffering. Usually there will be several people who say that they look back on their lives and do not feel they have ever really suffered. Maybe you feel that way too. I think this is because when we hear the word suffer, we tend to define it as extreme pain, or hardship, or abuse. We think of the suffering of Jesus on the cross, or of people who are dying of a terribly painful disease, like cancer, or who have had to live with a chronic illness most of their lives. And yes, all of these instances constitute great suffering, but the Buddha was talking about the suffering that every single human being experiences every day of their lives. I think that is what Jesus was talking about too. We are constantly looking to things outside of ourselves to be the source of our happiness and well-being, but these things never do, and never will, satisfy us for long. This is dukkha. This is suffering, because the not having causes us anxiety, and the satisfaction of having is very short-lived, and we are back to craving again. Of course we all need food, shelter, clothes for our bodies, safety, companionship and love. Jesus was not saying we should be totally unconcerned about these things. What he was saying, though, is that excessive concern about every miniscule facet of our lives, and the lives of others, causes unnecessary anxiety and worry, which causes us unnecessary suffering. He says, “Don’t go there! Trust that the generous love of God for you and for all people will always be with you, no matter what!” It’s all about trust. 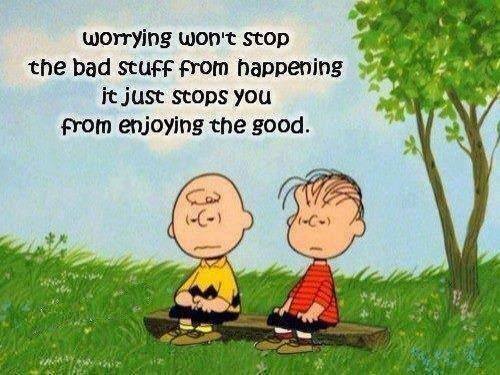 Don’t worry; be happy!